A couple nights ago, our parent education topic was "kindergarten readiness." Although there are some schools, sadly, that expect 5-year-olds to already possess certain literacy and math skills, most are more concerned with self-help skills like zipping up jackets, putting on shoes, and using the toilet, as well as knowing vital information like their own last names, their parent’s first names, their addresses and phone numbers. I don’t currently teach most of these things, at least not consciously, although I did teach these skills as a parent. I'm inspired to put a little more emphasis on those things, but have also found myself thinking about what "kindergarten readiness" skills I am trying to teach. Most of my kids are heading off to Seattle Public School kindergartens, which means that they'll potentially be in classes of 20 or more, with a teacher and an assistant of some kind. If Woodland Park kids are going to thrive, it will help to have a little experience with navigating a class of that size. 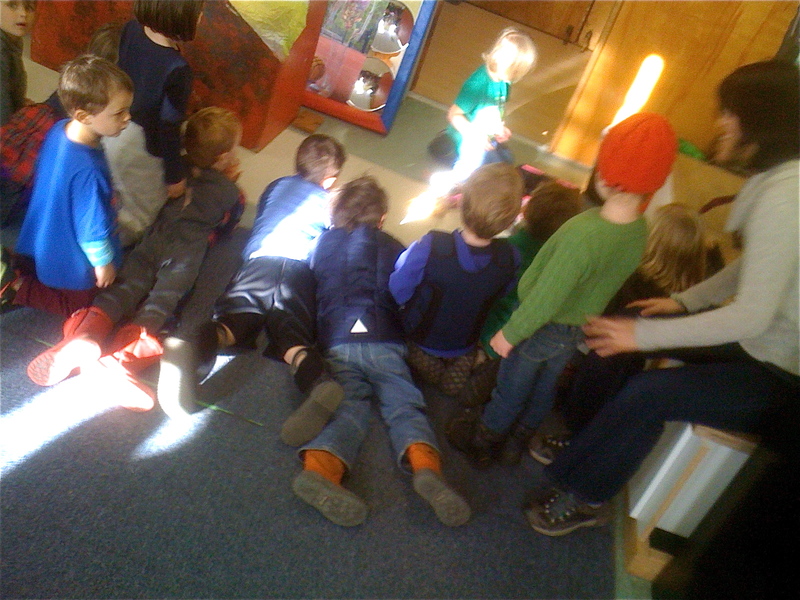 That’s one of the reasons I like larger classes in the context of a cooperative preschool. My ideal class sizes are 20 plus. This might sound outrageously large, and it would be in a traditional preschool, but because of our cooperative model we maintain child:adult ratios of between 4:1 and 2:1 depending on age, whatever our class size. Children who can focus on a single activity, even one in which they might not at first be interested or with which they struggle, for 20-30 minute stretches will be ready for the kind of curriculum that naturally emerges from the 10+:1 child-adult ratios found in kindergarten. As a teacher, when you alone are responsible for so many kids, you need them to have the capacity to engage in activities – even “challenging” ones – without a ton of adult guidance or persuasion. We begin practicing this skill with circle time, stretching the kids out as they get older. For our Pre-3 class, this might mean 20-25 minutes by the end of the year. As I wrote a few days ago, our 5's class has already demonstrated an ability to stay focused, as a group, for up to 45 minutes! I like Woodland Park kids to be confident in front of an audience, and its a skill we concentrate on with the 4 and 5 year olds, making sure each of them has a turn in front of the class at least once a week. Public speaking is like a muscle: exercise it, or it will whither. It doesn’t have to be a nerve-wracking experience. Raising hands is the entry level version of public speaking, but during their Pre-K and 5's years they find themselves in front of the room during their weekly “sharing time” (show and tell) as well as during “journals” (I read their journal entries to the class). By the time they “graduate” they will have had opportunities to sit in the “birthday throne” to talk about their lives, and an unlimited number of opportunities to present their stories from the front of the room. American’s consistently report “public speaking” as among their greatest fears, often ahead of “death.” Given how important that skill is, and how pervasive the fear, it only makes sense to work on it at a young age. Identifying and engaging the basic concept of fairness is an important social skill that we actively teach at Woodland Park. Children who expect to be treated fairly and who seek to treat others fairly, will not only tend to attract more friends and grow up to be better citizens, but they will also be better equipped for standing up to bullying. I want our kids to have a strong sense of what they know and to have the confidence to question adults when they are being told things that don’t fit their reality. The children at Woodland Park learn early that Teacher Tom often says things that are flat out wrong and it’s their job to set him right. When I say that I want them to question authority I don’t mean it in a defiant sense, but rather in the sense of our best educational traditions. I’ve spoken to a number of kindergarten teachers, from both public and private schools over the years about what they’re looking for as far as “academic” skills. They are not expecting the children to be reading, nor are then expecting them to be familiar with mathematical algorithms. It’s enough that they know the alphabet, can write their own names, count to 10, and be able to cut on a line with scissors. I’ve never gone out of my way to teach any of those skills, but we’ve never sent a child off to kindergarten who hadn’t mastered them.
. . . it is the job of our schools to get ready for their incoming kindergarteners, not the kids’ job to get ready for kindergarten. This is because kids come in such a wide range of skills and developmental needs. But even still, we want to help children be prepared to be successful as they move ahead in school. The most important thing that I think Pre-K teachers can do is keep school fun and help their students love to learn. Encourage their curiosity, interest to discover and explore, and creativity. We want them to love learning and have a desire to learn more. Ultimately, that's the kind of kid who will thrive in kindergarten and beyond. "We Probably Learned It From You"
Are Any Of Them More Important Than This?